There is a direct correlation between the modernization of the workplace and changing technological needs of business associates. To keep up with the demand for stylish, feature-rich IP endpoints that enhance and propel collaboration, Yealink has recently released its new T5X series. These high-end IP phones combine staple features from the original T5 series with new, powerful enhancements. 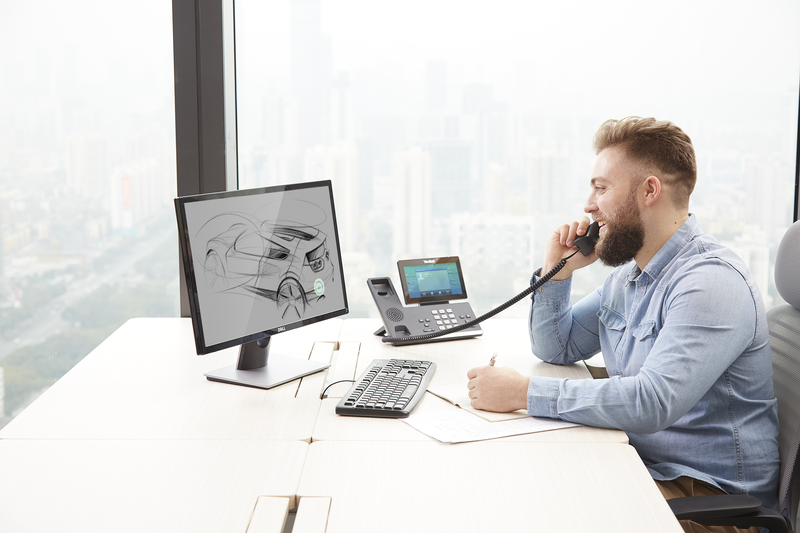 Whether your customers are looking to upgrade the T4S series or want to elevate the phone systems they’re currently using, 2019 is the time to be out with the old and in with new Yealink. The new T5 series has been packed with cutting-edge key features. Pre-existing features, such as the web interface, have also been updated and freshened up. Corded-Cordless Phone Feature: The Yealink corded-cordless phone offers small offices and home offices an all-in-one DECT solution. As a multi-line phone, the device supports up to four parallel calls, presenting greater scalability for voice collaboration. Thanks to DECT technology, it is easy to expand the phone system in busy work environments or by adding multiple handsets to one phone system. When only one handset is registered on a T5X, you can bind a slave handset. After binding, the phone will act as the master phone. The slave handset can share the line and contacts with the master phone. Calls can also be shifted between the master phone and the slave handset. Adjustable LCD screen: The new T5 series features adjustable screens. Adjust the screen as you like, whether its in different light environments (desk lamp, sunny window) or accordingly to your desk height & sitting position. Built-in Bluetooth & WiFi: Built-in WiFi is not only beneficial to the device user but is also cost-effective. By utilizing a device with built-in WiFi, you are eliminating wiring issues and have a lower cost than a wired network. Additionally, the cost of needing to purchase a WiFi USB dongle is eliminated. Built-in Bluetooth will allow users to connect Bluetooth headsets and mobile devices. Contacts can also be synchronized between the Yealink phone and a mobile phone through Bluetooth. Black-White LCD Display: The new T53/T53W sports a 3.7″ black-and-white screen. This simple interface provides a better text & visual experience in comparison with the small color screen of its predecessor, the T52S. When positioned against competitive models, the T53 word size is 1.5 times larger in the sitting position. This enables users to clearly read the screen from further distances. 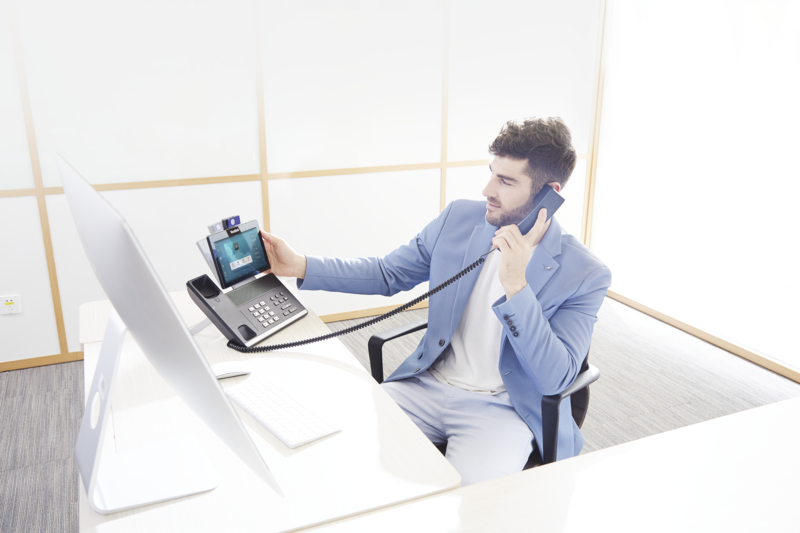 Content Sharing: You can use the T5X with the Yealink VC desktop to share content from a PC. Content will be shared on the computer screen in real-time and is transmitted through the phone – so no special server is required. Acoustic Shield: Audio quality is particularly important and can heavily impact user experience. Acoustic shield improves background noise suppression when using the phone’s handset or a connected headset. This feature will be beyond appreciated by those in an open office environment, such as a call center, where background noise frequently disrupts calls. The new T5 series is comprised of three different phone classes: the flagship smart video phone, smart business phones, and prime business phones. There is a T5 model for all associates with features that will fully satisfy their individual needs. The Flagship Smart Video Phone – VP59: The VP59 is the pinnacle of a high-performance smart video phone. It sports an 8″ capacitive adjustable touch screen phone, runs on Android 7.1, and has [email protected] full HD video. It boasts both built-in Bluetooth and WiFi and comes with a USB 2.0 port for USB headsets, media, and storage applications. It also supports up to 16 VoIP accounts, 3-part video conferencing, and 5-part video/audio mixed conferencing. The Smart Business Phones – T58A & T58A with Camera: The new T58A is a hardware upgrade from the previously revered T58A. While the name has stayed the same, the phone’s featured have been enriched. The old T58V has now been replaced with the T58A with Camera solution. The Prime Business Phones – T53, T53W, T54W, and T57W: These sleek business phones are equipped with all of the new features, including corded-cordless phone, content sharing, and acoustic shield. The difference between the models lies in the screen size, resolution, and color; however, all are feature-rich and can be paired with the EXP50 Expansion Module. With a phone fit for every employee, the T5X could essentially fit all customers; however, there is a specific subset to target. Potential customers are those who have the affordability for high-end products. The ideal customer will be one that values quality and feature innovation. For example, if your customer previously purchased a T42 or T48 and feels the LCD screen is not “good” enough, they may be a perfect fit for a T5X model. Additionally, customers who are interested in Android OS, video, adjustable screens, built-in WiFi & Bluetooth, and corded-cordless solutions would be natural targets. With the official launch of the Yealink T5X series on January 29th, you can now place orders for these devices through 888VoIP. Visit the 888VoIP Yealink Portal for more information. Looking to learn even more? Contact an Account Manager at 888-864-7786 to get the full rundown. The post New Yealink T5 Series: High-End IP Phones You Need appeared first on 888VoIP.